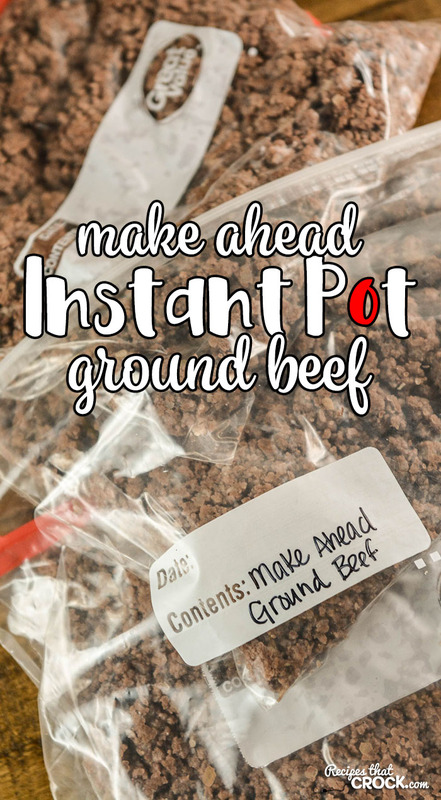 Instant Pot Ground Beef (Batch Cooking) - Recipes That Crock! 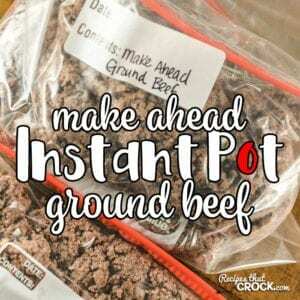 Are you looking for a Make Ahead Ground Beef Recipe for your electric pressure cooker? 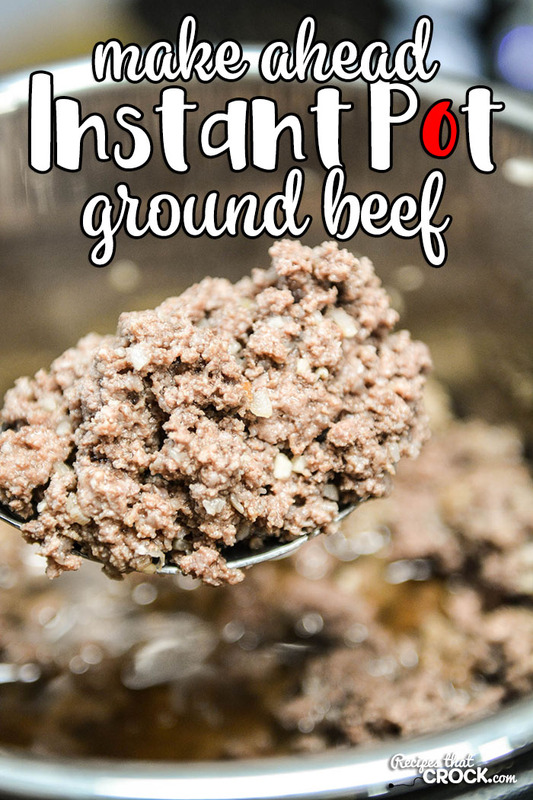 This Instant Pot Ground Beef Recipe cooks ground beef in bulk to freeze to make weeknight meal time a snap to throw together. We use this recipe regularly for batch cooking as an essential part of our low carb diet. We love our Crock Pot Make Ahead Ground Beef and our Electric Pressure Cooker Taco Meat around here. They are such time savers when it comes to throwing together soups and casseroles. I love cooking my ground beef in bulk and freezing for quick meal prep! 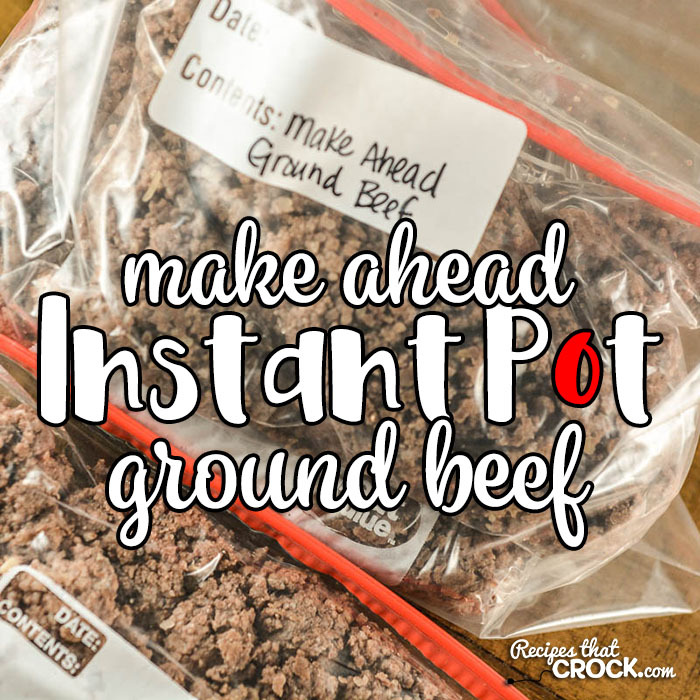 Since I love this kitchen time saver, I have been wanting to tweak our Make Ahead Ground Beef recipe to make it in our electric pressure cookers (Instant Pot, Ninja Foodi and Crock Pot Express). I also have been wanting to make it lower in carbs for quick low carb meal prep. So I simplified the original recipe and now we can batch cook 4 lbs of ground beef in a matter of minutes! This recipe can be made in any 6 quart electric pressure cooker including: Instant Pot, Ninja Foodi and Crock Pot Express. If you are using an 8 quart electric pressure cooker, you may need to add an additional 1/2 cup of broth to reach pressure. If you would prefer to use a slow cooker, you can use our Crock Pot Make Ahead Ground Beef Recipe instead. The fat content of your ground beef will impact the amount of meat after cooking. Higher fat contents will produce less ground beef than leaner varieties, just like when you brown ground beef in a skillet. We have used both fresh onion and dried minced onion in this recipe before with success. Desired amounts are a matter of taste (and dietary needs). Readers often ask what tool we use to break up our ground beef in the videos. We like to use our Zing Ground Beef Chopper. It is our favorite one of all that we have tested. Place ground beef down in the bottom of a 6 quart electric pressure cooker and add all ingredients. Briefly run a wooden spoon or ground beef chopper through the meat to break it up a little. Place under high pressure for 5 minutes and then quick release. Break ground beef up again and then place under high pressure for 10 more minutes. Quick release and drain liquid off of meat using a colander. Cool meat on a cookie sheet or large casserole pan until it reaches room temperature. Divide into four equal portions and bag in quart size freezer bags, pressing all air our of bags while zipping. If desired: Flatten bags and flash freeze on cookie sheet for a few hours until firm and then stack all four bags flat inside a gallon bag to save freezer space. To reheat, just remove from freezer and run bag under hot water for a minute or two to break meat apart. Toss frozen meat in a skillet to reheat quickly or directly into crock pot recipes and soups.